When it comes to protecting the water-using appliances of your home, a water conditioner system can be your first and best line of defense. While you may already be well aware of some of the many unwanted and detrimental effects of hard water, did you know that over time, gradual accumulation of limescale and calcium deposits can cause complete clogs and stoppages in plumbing? Such a situation would necessitate a visit by a licensed plumber for repair at the very least, and might result in a costly replacement of parts that may involve significant remodeling if a wall has to be removed. What’s more, hard water can also damage water-using appliances such as washing machines and dishwashers, making them less effective and reducing their functional lifespan. 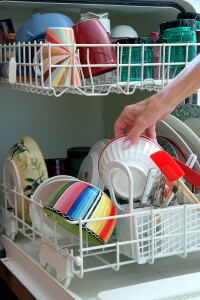 Limescale can permanently corrupt the heating element of a dishwasher, and can accumulate on and damage hoses, pipes, and pumps on various types of other appliances that depend on running water to function. The best way to solve this situation permanently is by installing a water conditioner system. Ideally, you’ll want to find a system that does not simply seek to filter or treat the symptoms of hard water, but one that attacks it directly, at the source. Hard water is caused by excess levels of calcium, magnesium, and other bicarbonate ions in your water supply. By exchanging these particles with harmless ions of sodium or potassium, water conditioner systems can remove hard water at its source, creating an unlimited supply of soft water to be dispensed whenever you need it. Installing a water conditioner will help to prevent further buildup from forming on your water-using appliances and plumbing, and over time any existing buildup may fade away entirely. What’s more, water conditioner systems will also produce a number of immediate beneficial effects, such as an end to soap scum, dishes that wash cleaner, and hair that feels softer and looks more lustrous after every shower. To learn more about the whole house water conditioner systems offered by RainSoft, including our cutting-edge EC4 system, contact your local authorized RainSoft dealer today.